You should have arrived here from Teresa's Blog. If not, you can join the fun from the Simon Says Stamp Store Blog to start from the beginning. You must create a project using a rubber or clear stamp, no digi images allowed, add your creation to the linky AND hop around the designers blogs leaving comments along the way. We are showcasing the new STAMPtember® products that have just been released. CLICK HERE to see them all. It is a HUGE release with loads of fabulous stamps, dies, stencils and much more! For my project, I used this intricate and beautiful Happy Birthday die. It was designed by the uber talented Kristina Werner. I took a simple approach with this die. First, I created colorful paper with Peerless watercolors. I then made the die ! After that, I strung it up with gold strings and added gold Stickles. edited: I realized that my first project does not contain any stamp!! So I am adding a card WITH stamps :) I created this card from SSS September Card Kit. I stamped the colorful balloons on the stripey paper (which came with the kit). With the help of MISTI, this can be done very easily. All stamps and inks are from Simon Says Stamp. If you just join the hop, you can find all the information about the hop over SSS Wednesday Challenge to complete your hop! This is the LAST stop..... Woohoo, you made it! I LOVE the colors on this, Virginia! Awesome card! The touch of gold is just brilliant! Love how clean and colorful this is. So pretty, love those colors against white nd gold! I love how you colored the paper and then cut out the Birthday die. Simple, but so elegant. Thanks for sharing. This is a great die AND A BEAUTIFUL card! Love the card and the beautiful way you colored the die! I love the rainbow colours on your die cut! Beautiful card Virginia! I love the touch of gold with the gorgeous ornament! So festive in the bright colors, Virginia! Love the touches of gold! love the birthday die, great use love the colors! Pretty cards. I especially love all the stamping and coloring you have done on your birthday card - truly awesome. Love the color combo, great inspirational projects! Both cards are lovely....a fitting finale for this fun blog hop! Like the rainbow color look. Has a suncatcher feel to the first creation. Gorgeous cards Virginia :-) the birthday bauble is beautiful, I love the multicoloured die cut and the white background with gold 'confetti' glitter, beautiful, and the stamped balloons on the 2nd card are fabulous too! OMG - I love the colorful die cut. Both cards are fabulous! Virginia, these are such fun cards! Really love the 1st card. Fabulous! Both cards are so cherry and beautiful!!!!! Just love all those happy colors!!!! Your dynamic duo of cards has planted a smile all over my face! Love the die-cut; adore your stamping! Fantastic cards! I love that birthday die! I was having trouble post! Now it is working and I love the Birthday cards♥ This is my Birthday month and I would be happy if I had either one! I do not have crafty friends!! I love the colours you used in both cards! The touch of gold in the first one is gorgeous. I love the bow ties on the multicolour balloons. wonderful cards..love the first one with the gold and gorgeous die. The birthday card looks so beautiful! Especially I like the clean and simple style. And the second card looks modern and stylish. I always love your cards and I'm very happy to see your card every wednesday at SSW challenge! Have a wonderful day Virginia! Your balloon card is super cute, love the use of the pp!! That Happy Birthday die is fabulous! Love your cards! What very happy cards these are!!! Both fabulous cards Virginia, your Happt Birthday bauble is gorgeous with stunning colours. I love the pretty balloons with a wonderful background!! You crack me up, Virginia - not using any stamps on the first card! Which is just beautiful, BTW. I love the soft look of the balloons on the lined paper. And they saved the best for last. Think your first card is simply spectacular with all that gorgeous color and touches of gold. That second card made me get a huge grin. Love that you used patterned paper to stamp those happy, colorful balloons. Beautiful! Love the gold details on the first card. Your edit cracks me up Virginia...that's why I love you~keeping it real ;). Both of your cards are SPECTACULAR...love the rainbow of colors. your cards are lovely. I love the Christmas die! you did such wonderful colors on it. I have a question for you. i'm desparately looking for a mint cardstock and stamp pad that matches the copic marker YG 41. its a lovely mint color and I cant find cardstock in michaels or joanns that matches it. if you cant do it please don't worry. thanks so much for sharing. Love both of your cards. That birthday die is really special and the background you created with the balloons on the paper is really a great look. Beautiful cards Virginia!! Love them both!! Love how you used color in your project. Beautiful!!! To craftytreen: I used Simon Says Stamp Mint Card stock (updated in my links). The quality and color can not be beat. I don't know if it will match the copic color that you mentioned. I haven't come across any mint color card stock that is better than Simon Says Stamp. I have Michael's, but it is thin and mint color is not as soft. Hope this helps. Awesome b-day cards!!!! Love the stamping over the pattern paper! That first card makes me reminisce about my tie-die days! I love the vibrant colours on the first die cut and the combination of stamps and patterned paper on the second is inspired! Oh my gosh, the bright colors on your first card drew me in ... love that card. Beautiful! What pretty cards, Virginia. The first one makes me smile with the lovely pop of colors. Both are festive and fun Virginia! What great cards, Virginia!! I love the little gold dots with the fun colors on the first one. The second one is the one where my jaw dropped, though. GENIUS stamping those balloons on that paper. Such a cool look!!! Fabulous design! What amazing cards you have created for this hop!! Wonderfully done and both just bursting with color and goodness!!! Love seeing your creations and I am just delighted with what you have created!!! Fun bright colors! I love both cards!! These are both fabulous, Virginia! Love the way you colored the birthday die!! Great cards! I really like your layering of images in the 2nd. Very creative. Beautiful cards. Love the watercolour die cut, so pretty.The over stamping on the printed paper looks fabulous. Simply beautiful! Love your cards! love the colors on that die. Wow these are gorgeous, so colourful! I love the rainbow colours of the first one and the details on the second one, just both amazing! i NEED that happy birthday die! Wowza! Love that tie-dye effect on the HB card - just AMAZING!!! Your first card with the colored die is just so beautiful with those drops of gold...very elegant!! I love how you stamped the balloons on the printed paper on your second card! Fantastic cards, I love the layered look of the stamped card. Funny, no stamps! Both cards are great, thanks for showing us. What fun cards! Love the colors in the first die cut...and the second is just down right fun ♥ Great job! Love the birthday cards! Great stamps and dies. Thanks for the inspiration. Virginia, I love your stunning and colorful cards!! You design beautiful work!! the ballon paper background is so cute! Love both cards, lucky you realised you needed to stamp something or you could have been in real trouble missy. Love all those colours on the happy birthday die. Gasp!!! What a gorgeous, delicate die all dressed in bright colors! Love both of your cards! Beautiful cards and color! Love the gold touches. Both cards are fantastic!! Wonderful details and design. BOTH cards are BEAUTIFUL Virginia!!! LOVE your RAINBOW of birthday wishes with the golden dots!!! As for your stamped card - WOW - your layers of stamping look AWESOME!!! Love the colors on the ornament card! Both cards are fabulous, Virginia. Love, love both of your cards! The contrast of colors on white and the stamping on patterned paper is both so beautiful!! Wonderful colors and gold sparkle!! LOVE IT! Wouw!! you made an awesome card!!! I love this a lot!!! Wow love love your cards as Always they are awesome. TFS. Oh my gosh Virginia, I love love love that watercoloured ornament - gorgeous! Love the rainbow of colors on both cards. Love your colourful happy birthday card, even if it totally missed the plot when it comes to the challenge it still great. Your stamped card is such fun too. Wow, stunning Virginia. So bright and colourful. I can't tell you how much I love your first card. It is fantastic! don't you just love this die! Oh love your card too! Thanks for sharing! Virginia, your cards are great, I especially like the first one. Love the watercoloured frame - the colour combination makes this Birthday card so fun & fresh, and those gold dot accents!!! Oh my! I loved the ornament card and all the pretty colors you used to make it. That is a great die because it makes it quite simple to make CHRISTmas cards because you don't need much else on the card. I also like the gold dots. Happy to see that even you are perfectly imperfect!!! I do some really silly things, Virginia [i.e. wrong colors for a color challenge!] So happy to see your second card ... I haven't had a chance to even open my September kit yet!!! LOve your birthday cards! I love the cards! I love how you created dimension with your border stamps! Love your bright and cheery cards!! Love the colorful cards, Virginia! Pretty cards. Love the colors. I like the way you combined the stamping with existing pattern on the paper! The balloons on the patterned paper are so pretty, Virginia! fabulous bright colors! Love this card! Stamps or no stamps, these cards are both amazing! I love the varied colors on the first, and the 2nd is just festive and fun! Great job on both! Your cards are so colorful. Love all of the shading of colors on both cards. thanks for sharing some delightful cards. LOVE your cards! They are so bright and colorful! Beautiful! Happy cards, fresh and fun! 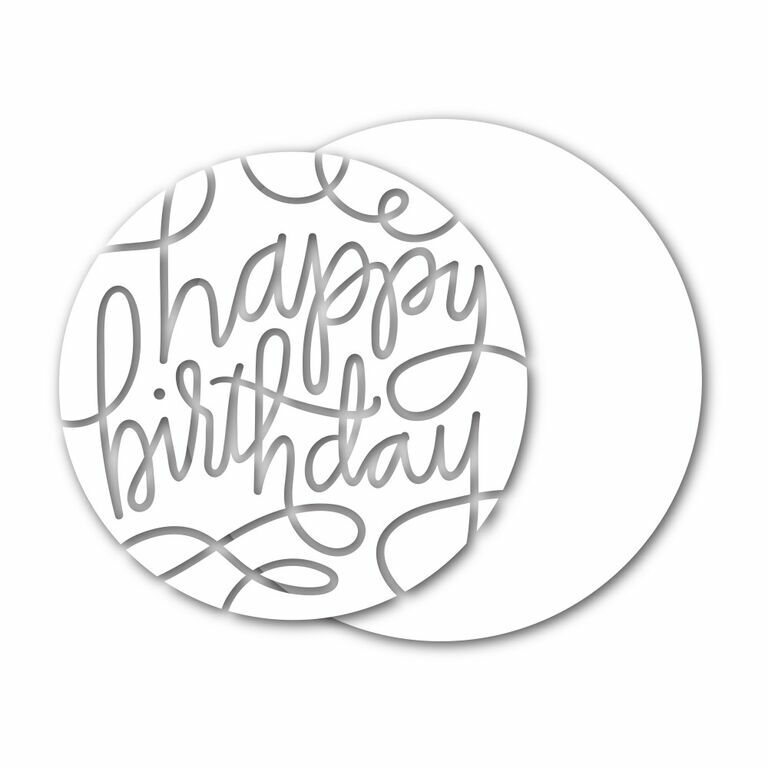 Two fabulous Birthday cards- the circle Birthday is absolutely beautiful. Love the way you applied the balloons as backgroud in your second card. Wooow! That card with the globe is super druper wonderful! Love how you colored the paper and diecut it! Awesome technique! Fantastic cards Virginia!!! Thanks you so so so much for all the inspiration throughout the year and for sharing your art and talent with us all! Both cards are fab! Love the use of color and texture. Love, love, love that Birthday die. I just got it and can't wait to use it. BUT, your second card is different, and I love it too The stripes compliment the circles of the balloons. Thanks for the inspiration. Beautiful cards, both! Loved the idea of stamping on pattern paper! I love both cards, the colors are fabulous! Beautiful cards! Love your designs! Thanks for the inspiration and blog hop! Awesome card!! I am really enjoying all the beauty made with the stamps and dies and inks! Love both designs. 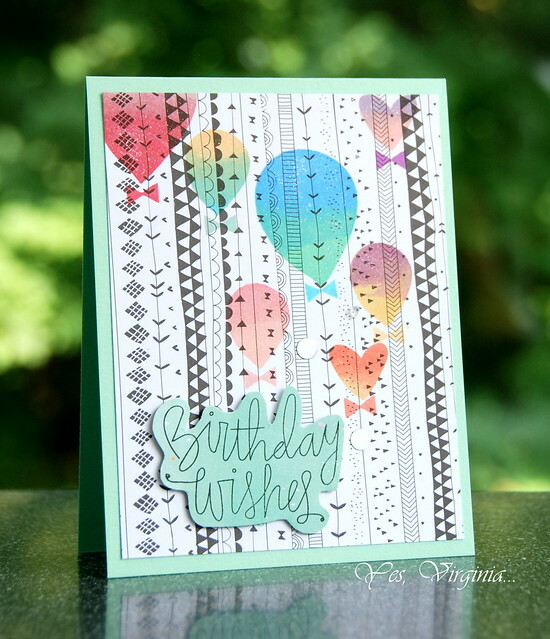 The first card w/o stamping is gorgeous with the beautiful circle die cut and the colorful balloons on the second card are beautifully arranged and stamped! Love your watercolor birthday card, it is lovely. Did you fussy cut the "birthday wishes" sentiment or use something like a scan and cut? Both are so fun!! That birthday one is really cool. Both cards are gorgeous! The second one is fantastic! Both cards are awesome but especially love the watercolor birthday bauble! I really love the Birthday ornament card, even if there wasn't any stamping involved. The color mix is pretty. 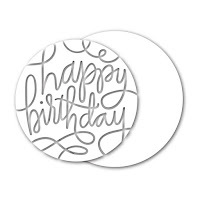 Love both your cards - though I am partial to the die cut Happy Birthday circle! Love the way your coloured the ornament die! And your stamped card with the pretty balloons is lovely! I love that first die you used but even more I love the way you colored it. Beautiful cards, love your use of colours. Wonderful colors and coloring, very inrpirational as it makes me want to try something similar! Fabulous.... I did notice that there were no stamps on your first card.... but never the less it is stunning. Love all the balloons on your second card. I love this die cut and your coloring is fabulous ! ! WOW! Simply swooning here over your 2 gorgeous cards, particularly the first one - that's just eye-poppingly gorgeous! awesome cards...i especially like the beautiful happy birthday its so pretty with all the nice colours!! So sad this is the last stop on the hop, but wow, what a stop it is! I love both of your amazing and colorful cards! That intricate die is a must have! Love all your bright colors and the touch of gold thread. Wonderful cards. That Happy Birthday die is a must have. Well done. 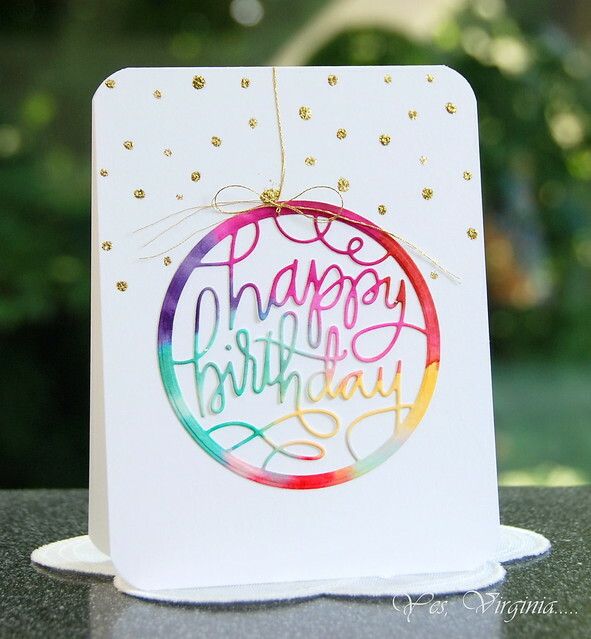 I LOVE that rainbow circle HAPPY BIRTHDAY die cut!! I was thinking I need that ornament die now! beautiful in rainbow colors! Love the cards, as always great creations! Rainbow is my favourite colour, I just love how you have used it so well for the beautiful die cut. The Christmas bauble is simply stunning! I love the colours!!! Your cards are so pretty, LOVE the colors!!! Great cards. Love that gold on the first one. you just can't beat Kristina's handwriting for stamps and dies, can you?! thanx for the inspiration and two great cards! oh squeal. i love the colors you bleneded on this. What wonderful cards! The first one is my favorite! I love this birthday die! Ha, glad you realised your first card didn't have any stamping, so now we get to see two cards! I do love that card though! Beautiful cards, your use of colour is fabulous! I like the balloons on the design paper. I haven't had time to look at my kit but I'm heading to that paper when I do. Both of your cards are so cute. I like so much the stripey paper of the second. I love your cards! Great colors. Hi Virginia, it's so pretty! I saw so many pretty cards using the SSS Christmas die. Very delicate design. Love it!